Absolutely love the neighborhood. However you aren’t roommate matched correctly whatsoever. Really specify what you want or you’ll get everything you don’t. Overall good, but service request completes really slow. That is really a big problem. My toilet didnt work once and I went to office to ask for help, and they said I need to fill out a service request, and then I waited two days and still no one come to fix the problem, and I dont know why I got an email said the problem already fixed. But my toilet still didnt work. Then I went to the office again and then they sent people come to fixed. The apartment community is pretty cool for the most part. There’s some pretty loud girls that live across the hall from me but it’s chill. Overall it’s a pretty welcoming crowd. Overall my experience at UE has increased this year I would say. I think a big problem with the way the preiss company groups people together is ignoring the student classification. My 2 years at UV were awful bc I lived with 30+ year old weirdos who would smoke in the apartment and get the cops called and no one at the office cared when I voiced concerns. My first year at estates was better but still pretty bad because while I did have another student I lived with the other guy was a morbidly obese 32 year old who left horrendous messes and left the apartment smelling and stinking and attracting insects. Now this year I’ve only lived with other students and I have little to no complaints, it’s a much better/healthier dynamic for me to not live around 30+ year olds who’ve more or less given up on life. I think a LOT of people would have better experiences if you guys were more careful with the way you roomed people together. A 19 year old student should have under no circumstance whatsoever been roomed with 30+ year old non students. Net positive, Love the maintenance team, those guys really go all out to support us, residents. Far and away, the best part of this place. Cool events pretty often, chances are there are 1 or 2 a month I'll find interesting to attend, my mug collection has expanded 3-fold. Haven't had any unsubtle reminders to renew my lease lately, feels great. My experience has been pretty good. I really like the study room and it being open for 24 hours. I do sometimes lose connection to the wifi. I also like the clubhouse however the pool tables have really dirty felt and the cues mostly have missing tips. The University Estates at Austin has been such a great place to live at for my first apartment! 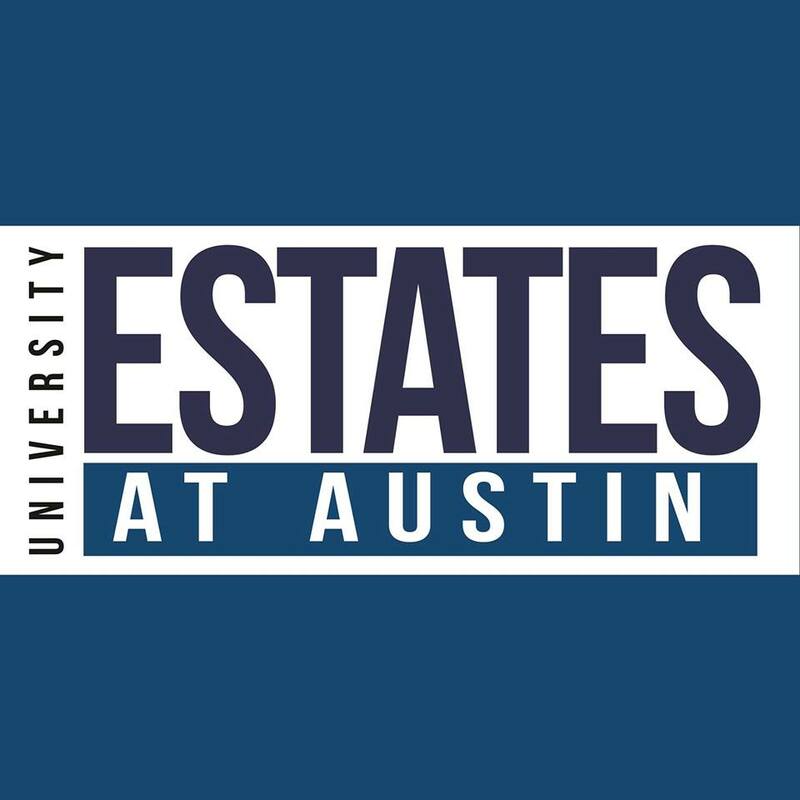 With them being quick to fix any issues I have with my apartment and the staff being wonderful, i'd highly recommend anyone the University Estates! University Estates provides a comfortable, homely place to live. Coming from Houston, its my home away from home. I’ve signed here for 2 years because of how great it is. I experienced no real big issues other than a couple of times when my water would be shut off due to repairs going on in the complex. Other than this, this is a large array of amenities which I enjoy ranging from a pool to volleyball. I have lived here for 2 years and have not had any problems. The staff is friendly and maintenance is quick to fix anything.It’s affordable, friendly and a safe location. It has been great overall. There have been a few questionable fines at times, but everything has been good. We haven’t had any problems with out apartment and we generally don’t have any problems with neighbors. Maintenance is always courteous and fast. It’s a decent apartment, not the best though. It’s jusy pretty average. Sometimes maintenance takes a long time to get things fixed, but otherwise response time is ok.
I’ve lived here two years and have enjoyed living here so much! I think the apartments are very well kept and clean. Maintenance is quick to fix problems. I enjoy the events that are held & think this is a perfect place to live if you are attending ACC riverside campus. It’s a nice apartment complex, the amenities are nice, but my applicances always break or leak. Walls are super thin as I can hear my above neighbors and next door neighbors so easily. Like the location though! Kenechukwu, thank you for sharing your experience! We love that you’ve had a peaceful experience here and hope we can keep you around for another year. Let us know if there’s anything we can do to better your experience! Pretty great for the price!!! Living here has been neat and the amenities aren’t bad either! I’ve lived here for two years and have renewed for a third! Brittany! We think you’re pretty great!! Thanks for leaving an awesome review; we appreciate you and are excited to have you around for another year 😊 We hope to see you at our luau, May 4! It’s a good place to live for the price. The quality of the apartment varies. Some people get lucky and don’t have pest problems, leak/flood problems or noise complaints, but there’s some that have all of these problems and more. So the apartment qualities are inconsistent. I’m basing my rating on the quality of my stay. I have had major bug problems and my apartment quality is decent. However, make sure you check the lease throughly and read other reviews, because it’s honestly a coin toss. The neighborhood is great. I just wish the apartment did better checks before someone moves in. Also the stuff in the apartment constantly needs fixing. Dajah! Thank you for sharing your experience! We love hearing great things about our neighborhood. Also, thank you for the constructive criticism! It’s always beneficial for us to learn how we can improve ourselves. If there’s anything we can help you with, feel free to reach out to us! University Estates has many amenities and the value is amazing. The commute to UT is fine for the price and what I'm getting out of it- my own bed and bath. Nithure, thanks for the great review! We’re so happy to hear you enjoy our amenities. Don’t hesitate to stop by the office or call us if you ever need anything! Tyler, thank you for sharing your experience! We’re glad to hear everything is good now 😊. The change in our cost of living reflects the change in the cost of living in Austin. If you’re ever in need of anything, please reach out to us! Well maintained, decent amenities, and staff has been pleasant. Security on the complex is minimal; while the gates are somewhat helpful, there are no cameras or security features to prevent break ins. My apartment has been broken into in the past, as well as have had items such as bikes stolen as well (despite being chained in front of my apartment). Could use some improvement. Shannon, thank you for taking the time to share your experience with us! We’re sorry to hear about the security issues that have occurred to you, but we thank you for your suggestion! We are always trying to improve. Please let us know if there’s anything we can do! I've loved living here so far! The amenities are great and the monthly events and prizes are a plus. The location and price are perfect for a college student. Thanks for review, Ashley! We’ve loved having you here, and we appreciate the kind words so much. Please let us know if you need anything, and we hope to see you at our big luau event, May 4! My resident experience has been amazing. I have been here for two years now and will be here next year as well. I have only had minor maintenance issues. Hey Marilee! Thank you so much for reviewing us! We are so happy to hear your experience as a residence has been amazing and that you’ve decided to stay with us for another year 😊 If you ever need anything, please reach out to us. When I first moved into UE, my unit was a complete disappointment tbh. The fridge door handle was not secured and the metal accent on my microwave was coming off. Then, when I looked at my room, the desk chair was in terrible condition, the room smelled like cigarette smoke, and some other things I'm not going to mention. My room being a complete disaster didn't make sense though because my roommates' rooms were nowhere near as bad as mine. Maintenance did fix some things in my room, but not everything. I have adjusted since then, and I can say that apartment community itself has been fairly great - my neighbors are quiet, and the front office does provide great events for the community. Austin, thank you for sharing your experience! We’re sorry to hear about your apartment condition on move-in day, but please feel free to submit maintenance requests on anything that needs to be fixed. We really appreciate our residents reviewing us, so we know where we can improve ourselves. 😊 Thanks again, Austin, and we hope to see you at our big luau pool party, May 4!! Bus stop is convenient, pool and gym are great and printing is reliable! Maintenance is in good timing. The area of Riverside doesn’t always feel safe but I feel safe within the gates of UE! Thank you for your review; we appreciate you! We are so glad to learn about your positive experiences here at UE, and it puts smiles on our faces to hear you feel safe within our gates!